Clara Cannucciari is a 94-year-old force of nature. She's also a presence on the Internet thanks to her website, her blog and her series of cooking videos on YouTube. 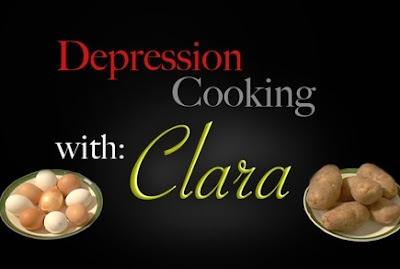 Her website, Depression Cooking with Clara, is the project of her grandson but the screen presence and the wisdom she imparts is all Clara. I am grateful to be old enough to have been raised by two people who came of age during the Great Depression and more grateful still to have had grandmothers who were young adults when the bottom fell out in 1929. I was raised with a sense that everything we had could well be temporary, but beyond that I learned first hand how resourceful my parents and grandparents were. My Grandmother Stewart in particular was always after us to be grateful for how good we had it, always quick to illustrate her point with a story about re-using wax paper or having a single pair of shoes. Due to her indominable spirit and great sense of humor, I could listen to her stories for hours on end. I was fascinated by a time where people seemed to have nothing, yet instead of being broken by it, people seemed to grow stronger. My grandmother could whip out a meal from a handful of potatoes, a can of green beans, a bit of cabbage and a sliver of ham that was both basic and filling, and all the while she'd tell stories about how it used to be. I still make that potato and cabbage thing for myself and I think of her every time. I don't need to feed myself for a week on a dollar thankfully and I hope I never have to. Recreating one of my grandmother's recipes makes me think that I could if I had to though. And it's funny, when I sit down to a bowl of that cabbage and green bean soup(Depression Stew she called it), I remember her fondly but the food doesn't taste the same as it did when it was prepared by good old Gram. Something goes missing because she's not around to tell me stories of resilience and self-reliance, all delivered with her crackling wit and genuine love of life. So enter Clara Cannucciari. Clara not only cooks with simple and inexpensive ingredients, she does it with humor and some really great stories. It's almost as good as having a grandmother around to talk to me as she cooks. So as this generation stares into what could well be the abyss, it's valuable to know that people have lived through worse and come out of it stronger and happier than they would have been otherwise. So thanks Clara, you make me feel like I have a grandmother again. Thanks Kelly. I got a little misty when I was writing that post. Misty and I was hit with a sudden craving for cabbage. When my grandmother passed away 15 years ago, I was happy to get the Texas ware bowls that she used to bake cakes on a regular basis. I am not sure that my baking is as good as hers, but the bowls at least give us a culinary connection. We can learn so much from the past, if we care to listen. Scintilla and Ming, I'm glad you were moved to comment on this post. Clara seems to hit a lot of people the same way, and I'm glad I'm not the only one out there who had some good memories spurred by Clara's "Poor man's meal." My mom taught me a lot of cheap, filling soups & casseroles. She was raised on a farm in Idaho, and their "kitchen garden" fed her whole extended family, including the folks in town. When I was a kid and the weather was right (dry, crisp & clear) she'd make molasses taffy and the neighborhood would come in and help pull. Nobody cooks as well as my mom! She'll be 88 this month.